So you’ve set up shop at home, but for some reason the home owners association won’t let you keep a tank of acetylene (next to a big tank of oxygen) big enough to turn the neighborhood into a crater. This may be the one time the HOA is right, but don’t tell ’em I said so. What you really need is a plasma cutter. Yeah, they’re a little expensive, but once you see what you can do with one, you’ll be ready to raid the kids’ college money. We tried out Hobart’s entry level AirForce 250A, and we’d have a hard time without one now. Thankfully, it’s part of our long-term test group, so you’ll see lots more about it in future posts. Read past the jump to find out more about our experiences with the 250A along with lots of pictures. Push aside all the complex concepts the word “plasma” brings to mind, and just think of the plasma cutter as a love child between a TIG welder and an air compressor. An arc from the torch to the workpiece heats and melts the metal, then compressed air — pumped through a port in the center of the torch — pushes out the molten metal completing the cut. The AirForce 250A ships in a very well-designed box weighing (according to UPS) 56 lbs. Be careful when you pick it up — it’s heavy for its diminuative size. Ours shipped with the ICE-12C torch pre-installed. In fact, everything came pre-assembled, which makes getting started with the 250A really simple. Note: Click on smaller photos for large ones. On the front panel you’ll find some really simple controls: a power switch, a power light, and an error light. The error light tells you whether or not the cup is grounded, the input voltage is incorrect, or if the cutter is overtemped. Besides that there’s also a little pictograph showing the thickest material that the cutter can handle in steel, stainless, aluminum, galvanized (though you should avoid galvanized because of the fumes), brass, and copper. According to Hobart, the 250A can cut up to 1/8″ steel and “sever” (read: rend in two in a horribly messy way) up to 1/4″. The torch features a two-part trigger. To activate it, you have to squeeze both parts together. This makes it harder for you to accidentally turn it on by laying it on a table or metal workbench. That would be bad for the workbench. The torch’s lead is 20′ long as is the grounding clamp, and the power cord is 10′ long. The plasma cutter’s electrodes are consumable, so Hobart included a few along with the 250A to keep you cutting for a bit before you need to make a trip to the supply shop. Read on to page two for our in use experiences with the 250A. Nice summation guys.. I’d been looking for this review since you guys discussed it on the podcast. One thing, it would have been nice to see some close-up shots of the cuts after you were done with them. To really see what the unit can do. Rick: Thanks as always for the comments. We shoot ’em at 7 MP, but 450 px is the limit for TM’s three-col format, so it’s the biggest we publish. it might be worth mentioning that plasma gives you the option to cut non-ferrous (aluminum etc.) metals. which you can’t do with oxy-acetylene. The pictures are actually scaled to 399×300 (at least for me) when clicked on for the first time, then 450×338 after the second click. Seeing as the second click brings you out of the format of the webpage and simply displays the picture alone, I dont see why they cant be bigger? Not sure if you do much welding/cutting/brazing and the like, but you should really be wearing not flammable clothes that cover large parts of your body, i.e. legs, arms, and chest. You only have to get a bit of slag in your shoe once to find out you need to wear pants. Thanks for the story, but I have one quibble: I’m surprised and dismayed to see pictures of someone using a plasma cutter wearing shorts and a sleeveless shirt. Is that really good safety practice? 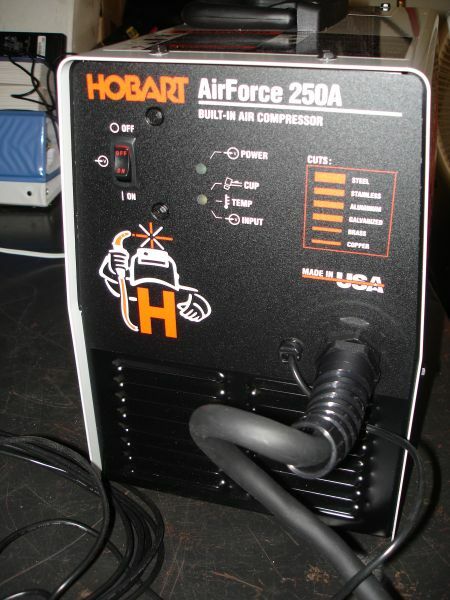 I am realllllly surprised to see any positive comments about the Hobart Air FArce 250A Plasma cutter,I have owned 2 of them and they wouldn’t make a pimple on a real plasma cutters hiney.I bought a reconditioned unit from Harbor Frieght,after trying to use it I figured it just wasn’t reconditioned good enough and returned it,I then bought a brand new one from our local welding supply house,and it cut just as crappy as the recon unit.This is one experience with Hobart,don’t get me started on the Hobart 140 Mig welder.A word to the wise.buy quality equipment.Hobart used to stand for quality,but since Miller bought them out,you may as well buy Chicago Tool. don’t worry about the clothes. how can you see what you’rte doing with a welding helmet on??? i find shade 5 torch glasses to be sufficient eye protection. as for the performance of this unit: i have used larger ones (rated for 1/2″ or better) and this unit, IF NOT USED BEYOND CAPACITY, will perform. the key here is to cut not more than 1/8″. just because it can “severe” 1/4″ DOES NOT, in my opinion, mean it can cut 1/4″. nor does it mean you should even try. if you need to cut thicker material, get a bigger unit. btw, never buy “reconditioned” items. you’re asking for a let-down. you may get lucky once in a while, but play it safe. stay away. 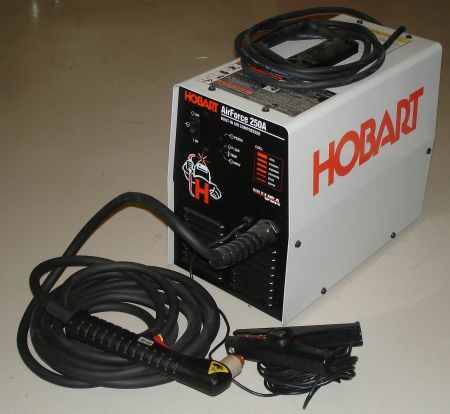 Hobart is a chain store brand of Plasma cutters and usually they are cheap that is how they can be marketed in chain stores. If you want a real plasma cutter you need to go to a welding supply store. I prefer Thermal Dynamics products because of their reliability. Plasma cutting is what their business is based on. They just celebrated their 50th anniversary in the field of plasma cutting and their products show it. I had the privilege of cutting with their new CM TRUE 52. Now that is a serious plasma cutter, not for the faint at heart.